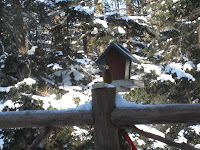 Adirondack Lifestyle ™: This Adirondack Lifestyle is for the Birds! This Adirondack Lifestyle is for the Birds! Great Wrap for Adirondack Fall 2008 - Big Snow!